When I think of nuts, my thoughts invariably wander to chunky chocolate brownies stuffed to the gills with nuts, asian stirfries featuring cashews or a simple snack of wasabi peanuts (my latest guilty pleasure). Not to mention peanut butter - a sandwich filling hero for kids around the world. Never in my wildest dreams did I imagine I would be making a nut butter from scratch though. Say what? Not only did I have to make a nut butter from scratch but I had to find a way to use it in a recipe too? I'm not going to lie, my initial thought was "urgh" followed closely by "you've got to be kidding me". But, brave soul that I am (the things I do in the name of blogging...), I forged on. And who would've thought that making nut butter would turn out to be so easy? Throw the nuts into your food processor and blend blend blend. Easy as pie, and just as tasty. Side-note: This particular application of nut butter (adding more water to form a cream) is sheer genius, resulting in a rich, creamy texture and taste without any dairy in sight. So if you're lactose intolerant, I got your back. 1. Meanwhile, heat olive oil in a large frying pan and brown the chicken on all sides. Turn heat down to medium-low, cover and steam for 10 - 15 minutes or until chicken is cooked through but still moist. Remove, slice and set aside (keep warm). 2. Deglaze pan and add more oil if necessary before frying the onions and mushrooms until tender. 3. Make your pecan cream by processing the nuts until smooth using a food processor. When the nuts start to pull away from the sides and resemble a paste, add a cup of water and process again briefly to form a cream. Add salt to taste. 4. Add pecan cream to the mushrooms, along with the sage and bring to a boil. Reduce heat and simmer for a minute or two or until reduced slightly. 5. 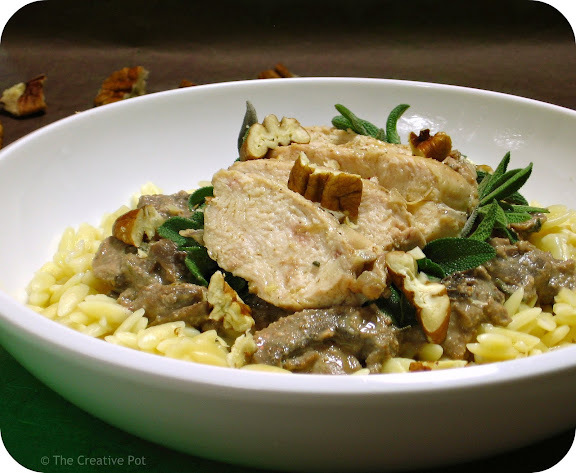 Serve the mushroom cream over pasta of your choice (I used orzo) and top with sliced chicken. Garnish with nuts and serve warm. I'm in love, I hope you realize. Not only does this have a nut butter IN IT. But it has a homemade nut butter IN IT. Bestill my heart. What a great recipe, and it looks delicious. The pecan butter could be used for all sorts of other things as well, and no dairy is a bonus! Words can't even begin to express how amazing this looks! Wow. A true Daring Baker Ambassador........this is so the right food for today's weather. Well done for stepping up to the challenge. I've got a challenge for you soon! Joanne - Yeah, I knew you were a big nut butter fan! You should give the homemade ones a whirl, it's a lot easier than it looks. OohLookBel - Definitely, I'm looking forward to explore nut butters some more in future! There is only one person more excited about me making this recipe than me...and that's my boyfriend! Neither of us can wait! You sure can take wonderful photos they look so delicious and your excitement is infectious superb work on this challenge. Cheers from Audax in Sydney Australia. I can't even begin to explain how happy this makes me .. As discussed, easy, interesting, impressive dishes? yes please! Well done YOU!! Now, can I come over for dinner, already? YUM - your pecan chicken looks and sounds delicious! Your photos are beautiful and I am sure that that was quite a delicious meal. Great job with the challenge!! Great job and this dish sounds so creamy and delicious. Would have loved a taste of this. You're so right about the creamy-ness of the nuts sans the milk. I'm not done w/ this challenge, now i have to add pecan butter to my to-do list. Good job!!! Great job on the challenge! Looks great! Gorgeous photo! I have to make that dish it looks so good!! Really lovely, the suns not up yet and already I want pasta. Nut butters make great pasta sauces. I like your creation but why didn't you make chocolate nutty butter brownies?? Looks good. I made your galette last night, will blog it later. What pure decadence! Nuts about this!! Your photos are really looking great, you managed to capture the succulence of the chicken perfectly - great use of light and background. You take wonderful pictures! Great job! This looks utterly gorgeous! WOW!! The dish looks wonderful and we have no doubt tasted wonderful too. Well done!